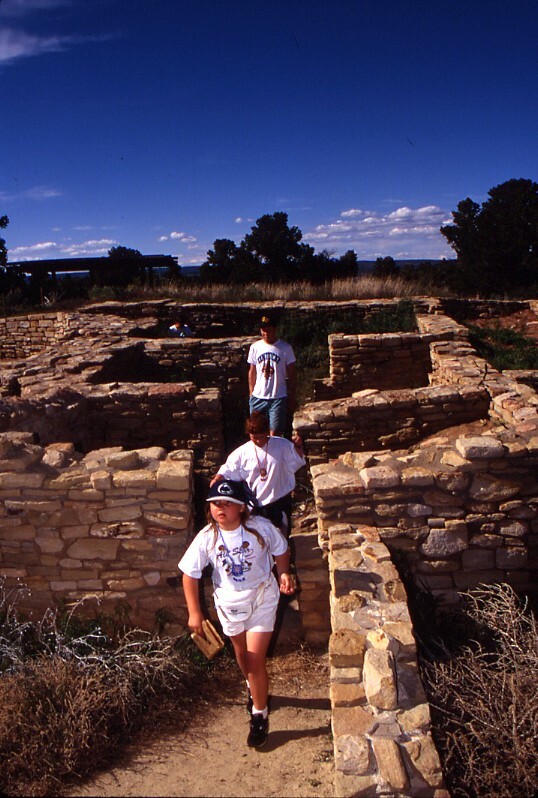 Children enjoy exploring Escalante Pueblo. The Anasazi Heritage Center provides information about and access to three Ancestral Pueblo sites: Escalante Pueblo (ADA accessible), Dominguez Pueblo, and Lowry Pueblo, in addition to museum exhibits on archaeology, local history, and Native American culture. It is the starting point for visits to Canyons of the Ancients National Monument. Montezuma County (pop. 24,778) has been a trading center for more than 2000 years. Area stories weave together to create a living history of Native peoples, Spanish explorers, and modern ranchers and farmers. Native American heritage is highly visible in the archaeological sites of Mesa Verde National Park, the Canyon of the Ancients National Monument, and the Ute Tribal Park. After the Ancestral Pueblo people migrated from the area, Navajo and Ute people arrived in the 14th and 15th centuries. Later the Spanish traversed the county in the late 1700s, en route to establishing the Spanish Trail. Their influence is seen in place names throughout Montezuma County. Organized in 1889, Montezuma County historically developed as a result of providing mining towns in the San Juan Mountains with supplies. Dolores-area timber resources were harvested for building; Mancos Valley cattle ranches fed the mining communities; and the lower elevations of the county around Cortez supplied agriculture products. By the turn of the 20th century the mining boom had played out and agriculture became the mainstay of the county. Today the county depends on tourism in addition to agriculture and light industry. The Trail of the Ancients National Scenic Byway has created a public-private partnership among the National Park Service, the Bureau of Land Management, the Ute Mountain Ute Tribe, the Cortez Cultural Center, the Crow Canyon Archaeological Center, and the Mesa Verde Country Tourism Office. In 2006, the Mesa Verde National Park Centennial is the focus for a year-long celebration, joining the annual Mesa Verde Country Indian Arts and Culture Festival offered at various sites throughout the county each Memorial Day.